Dragon Ball Z: Resurrection 'F' (Japanese: ドラゴンボールＺ　復活の「Ｆエフ」, Hepburn: Doragon Bōru Zetto: Fukkatsu no 'Efu') is a 2015 Japanese animated science fantasy martial arts film, the nineteenth movie based on the Dragon Ball series, and the fifteenth to carry the Dragon Ball Z branding, released theatrically on April 18. It is the first Japanese film to be screened in IMAX 3D and receive screenings at 4DX theaters. Resurrection 'F' is the second film personally supervised by series creator Akira Toriyama, following Battle of Gods in 2013. Like the previous film, it was considered an official part of the Dragon Ball storyline. The movie depicts the return of the villain Frieza, as well as the God of Destruction Beerus and Whis from Battle of Gods. After his resurrection via the Dragon Balls, Frieza goes into extensive training for the first time in his life so that he can exact his revenge on the Super Saiyans that destroyed him. The film received worldwide release, both in the original Japanese language and in localized dubbed versions. Funimation's English dub of the film received a limited release in North American theaters on August 4 and ran through until August 13, 2015. Madman Entertainment released the film in Australian theaters on August 6, where it ran through until August 19, 2015. Manga Entertainment acquired the rights for the release in the United Kingdom in September 2015. The film received generally favorable reviews, with critics praising the quality of animation and the fast-paced action sequences, while criticizing its formulaic and lackluster story tailored for a dedicated target audience without a broad appeal. The second story arc of Dragon Ball Super, the newest canonical anime series in the Dragon Ball franchise, retells the events of Resurrection 'F', although some details have been altered, including the addition of extra scenes, subplots, and episodes set before the events of the film to cover the 13-episode arc. The remnants of Frieza's army, led by an alien named Sorbet, head to Earth where they convince Pilaf, Mai, and Shu, who have collected the Dragon Balls, to summon the wish-granting dragon Shenron. Sorbet makes a wish to revive Frieza, but Shenron can only bring him back to life in the form of the pieces that Future Trunks cut up, which Sorbet's minions reassemble using their advanced technology over the following two months. Once restored, Frieza plans revenge against the Super Saiyans, but upon learning that Goku has gotten stronger to the point of defeating Majin Buu and fighting Beerus the God of Destruction to a stalemate (as Buu and Beerus were the only two beings in the universe Frieza was warned by his father never to cross), he postpones the invasion so he can train himself for the first time in his life. Jaco the Galactic Patrolman travels to Earth to warn Bulma that Frieza is approaching, and she gathers five of the Z-Fighters. With Goku and Vegeta training with Whis on the planet that houses Beerus, unaware that Frieza has been revived, Gohan, Piccolo, Krillin, Master Roshi, Tien Shinhan, and Jaco fight off Frieza's soldiers; however, the five Z warriors are unable to beat Frieza, even with Gohan as a Super Saiyan. Bulma is finally able to reach Whis; Goku and Vegeta return to Earth to face Frieza. Whis and Beerus join them in order to eat a strawberry sundae Bulma has prepared for them, neither caring about the outcome of the battle. Despite powering up to Final Form, Frieza is unable to defeat Goku, but the latter deduces that he is holding back. The two then agree to fight at full power, with Goku transforming into a new form with a glowing-blue aura called Super Saiyan God Super Saiyan (超 (スーパー)サイヤ人ゴッドSS (スーパーサイヤ人), Sūpā Saiya-jin Goddo Sūpā Saiya-jin), and Frieza evolving into his new gold-plated form "Golden Frieza" (ゴールデンフリーザ, Gōruden Furīza). Although Frieza is finally able to gain the upper hand, Goku and Vegeta soon realize that Frieza's golden form drains his powers quickly, due to his lack of mastery. Goku eventually turns the tables, beating down Frieza. He gives him the chance to leave, but is shot in the chest by Sorbet's ray gun when he lowers his guard. Frieza stands over the incapacitated Goku, and offers Vegeta a chance to kill Goku and to command his future army, but Vegeta refuses, transforming into his own Super Saiyan God Super Saiyan form. When Krillin attempts to revive Goku with a Senzu bean, Frieza attacks him, but Vegeta deflects the shot, which kills Sorbet. Vegeta ends up battering Frieza, knocking him out of his golden form. Humiliated and angered, Frieza shoots a blast into the Earth, destroying it and Vegeta. Goku, Whis, Beerus, and the Z fighters are left on a small piece of rock in space, where they lament the loss of the planet; Goku regrets not killing Frieza when he had the chance. Whis remarks he can turn back time up to three minutes and, after doing so, Goku destroys Frieza with a Kamehameha, much to Vegeta's anger. In the aftermath, as the characters say their goodbyes to Beerus and Whis, Goku and Vegeta discuss the assertion by Whis that, if the two of them were to team up, opponents like Frieza would not have a chance to knock them out. Vegeta replies he would rather die than go through that again. Goku agrees and laughs as Vegeta smiles and remarks that it is about time they finally agree on something. In a post-credits scene, Frieza returns to Hell, and to his dismay, is welcomed back. The film was originally announced in July 2014 under the tentative title of Dragon Ball Z 2015 in the September 2014 issue of V Jump magazine. The image of Son Goku in Super Saiyan form using the Shunkan Idō technique confirmed Akira Toriyama's credits for the original concept, screenplay and character designs and his mention that the film would be a continuation of his original manga. The author stated that the film will also be a sequel to Battle of Gods, that he strictly scrutinized all the dialogue, and promised more action scenes. A flyer of the same image, with a backside showing Shenlong, handed out at the Jump Victory Carnival event on July 19 revealed that Dragon Ball Z animation supervisor Tadayoshi Yamamuro is directing the new film. Later that month, a short teaser trailer was released of Shenlong bringing someone back to life with text calling this "The worst wish in history." (史上最悪の願い。), followed by Goku transforming into a Super Saiyan. 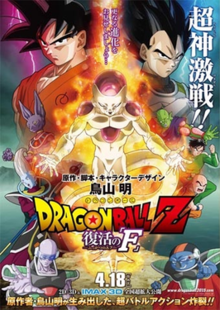 In November 2014, the film's Japanese title of Dragon Ball Z: Fukkatsu no F and basic plot outline were unveiled in the January 2015 issue of V Jump. A promotional image released for the film depicts Frieza, Goku, Vegeta, Piccolo, Son Gohan, Krillin, as well as the God of Destruction Beerus and Whis from the previous film Battle of Gods. Also featured in the image were two new characters that are servants of Frieza, Sorbet and Tagoma. Producer Norihiro Hayashida said that although Toriyama came up with the story for Battle of Gods, its script was actually written by someone else. Therefore Resurrection 'F' marks the first time the original creator wrote a screenplay for the series. He revealed that Toriyama had the idea to bring Freeza back while attending a concert by the metal band Maximum the Hormone. It came to him while watching them perform their 2008 song "F", which is about the fictional character. Hayashida also admitted that the team gave the film a fast pace by focusing on fight scenes for the American audience, which "may have caused some shortcomings on the dramatic level." On December 5, 2014, the first full trailer for the film was aired on Fuji TV's morning show Mezamashi TV. The following day a slightly different trailer and a special audio message from Frieza (Ryūsei Nakao) were added to the film's official website, as well as some of the cast and crew. People who order advance tickets receive an earphone jack strap of either Goku or Frieza designed by Toriyama. Momoiro Clover Z appeared with Masako Nozawa at a press conference in Tokyo on February 3, 2015, where it was announced that all five members will have roles in the movie as "angels from hell." Costumed mascots of Son Goku and Frieza were also present at the event which was held on Setsubun, and accordingly beans were thrown at Frieza in the mamemaki tradition. On March 2, 2015, a second full trailer was released for Resurrection 'F' revealing Frieza's new form, covering his skin in both gold and dark shades of purple. Other details included in the trailer were a defeated Gohan and Goku, Frieza's henchmen fighting against Piccolo, Tien Shinhan, Master Roshi and Krillin. It also features Jaco from Toriyama's 2013 manga series Jaco the Galactic Patrolman, which is set before Dragon Ball. A trailer featuring the series' heroes fighting Frieza and his 1,000-man army was released on March 24 by Mainichi Shimbun. In April 2015, the 20th issue of Weekly Shōnen Jump revealed Goku's new form of the Super Saiyan God transformation he acquired in Battle of Gods. Toei released a short advertisement depicting Goku and Frieza fighting in their new forms, days before the magazine's official release. This music video takes its theme from the Dragon Ball universe with the members of Momoiro Clover Z dressed as its characters. Like the previous film, the music in Resurrection 'F' was composed by Norihito Sumitomo. Its theme song is "Z no Chikai" (『Z』の誓い, "Pledge of Z") by the Japanese idol group, Momoiro Clover Z. A Toei producer said each member is a fan of the series. The song was released as a single on April 29, 2015 and includes a cover of Hironobu Kageyama's "Cha-La Head-Cha-La", the original opening theme of Dragon Ball Z. An English-language version of the song has also been recorded for use in international versions of the film. Maximum the Hormone's 2008 song "F" appears in the film during two different scenes. The film's original soundtrack, containing 32 tracks, was released on May 8, 2015. In December 2014, Toho Cinemas collaborated with Resurrection 'F' for a television commercial promoting their Cinemileage Card. In it Frieza explains how the card program works and Goku's yelling of Frieza's name appears as a pun on the word "free." A three-chapter manga adaptation of the film, drawn by Toyotarou, began in the April 2015 issue of V Jump. As part of a collaboration with the J. League Division 1 football team Yokohama F. Marinos, a special poster with players mimicking the film's own was displayed in promotion of their matches with Vegalta Sendai on April 12 and Shonan Bellmare on April 25, 2015. In March 2015, a collaboration between Toei Animation and Kirin Company spawned two dance parody commercials tying Resurrection 'F' with Kirin's Mets cola beverage, with the grape flavor advertisement featuring Frieza and his henchmen, and the orange flavor ad featuring Goku and the other heroes. A collaboration with Curry House CoCo Ichibanya ran from April 1 to May 31, 2015. Anyone with a receipt of over ¥1,000 from one of the restaurants could send it in to enter a merchandise lottery, where they could win exclusive items such as shot glasses and a platter featuring Goku eating curry. Frieza's new form from the film is a playable character in the video games Dragon Ball Heroes, Dragon Ball Zenkai Battle Royale, Dragon Ball Z: Extreme Butōden and Dragon Ball Xenoverse. Extreme Butōden also has Goku's new form from the movie as a playable character and Vegeta's as an assist character. Along with Frieza's new form, the Super Saiyan God Super Saiyan forms of both Goku and Vegeta also appear as downloadable content in Dragon Ball Xenoverse. The first 1.5 million filmgoers received a book called Dragon Ball Volume F (ドラゴンボール 巻「Ｆ」), which includes Toriyama's complete script for the movie as well as design materials. They also got either a Goku or Vegeta card for the Dragon Ball Heroes arcade game and a certificate that gives them access to exclusive content for five different Dragon Ball video games. Like its prequel, the events of Resurrection 'F' were later adapted as the second story arc of Dragon Ball Super, with some events being altered or expanded in the series' version of events. The "Resurrection 'F'" arc covers episodes 15-27. Resurrection 'F' opened in 658 2D and 3D theaters across Japan on April 18, 2015. It is the first Japanese film to be screened in IMAX 3D Digital theaters, shown in eighteen such establishments across the country. The previous movie Battle of Gods was the first ever Japanese film to be shown at IMAX Digital theaters, but was not in 3D. It is also screened in ten 4DX theaters across Japan, which adds environmental effects such as seat motion, wind, rain and scents to the standard video and audio. Prior to its nationwide release, preview screenings were held in seven different cities for 2,264 winners of a lottery held amongst 24 different Shueisha magazines. The earliest four taking place on March 30, two more the following day, and the final two on April 2. The film was planned to screen in 74 countries worldwide. On March 15, 2015, Funimation announced that they licensed the film for North America and, together with Toei, screened the subtitled movie at Grauman's Egyptian Theatre in Los Angeles on April 11. Their English language production premiered in North American theaters on August 4 for a limited run, initially to August 12, and then extended to August 17. It opened in Canada on Thursday, August 6. Madman Entertainment released the film in Australian theaters on August 6, both subtitled and dubbed in English, where it ran through until August 19, 2015. On July 26, 2015, at MCM Manchester Comic-Con, Manga Entertainment announced the release of the film in the United Kingdom in September 2015. On review aggregator website Rotten Tomatoes, the film has a rating of 81%, based on 16 reviews, with an average rating of 6.2/10. Shawn Saris of IGN awarded the film a score of 8 out of 10, saying "DBZ: Resurrection ‘F’ is a fast-paced film with tons of action and great animation, but lacks any meaningful punch." Sam Leach of Anime News Network gave the film a B. Resurrection 'F' received a Silver Excellence Award at the 33rd Golden Gross Award and was nominated for Animation of the Year at the 39th Japan Academy Prize. Dragon Ball Z: Resurrection 'F' opened at number one in the Japanese box office, earning approximately $8.1 million with 716,000 tickets sold in its first two days. It made 40.3% more and sold 27.4% more tickets than Battle of Gods did in its opening weekend. Deadline Hollywood reported that it had the biggest opening in Japan to that point for 2015, making Japan the only territory in the world where Furious 7 did not debut at number one. The film earned around $10.9 million by its sixth day and sold 1 million tickets by the end of its first week, making it the fastest film to reach that attendance number in Japan to that point in 2015. By May 6, 2015, it grossed 3.1 billion yen (approximately $25.9 million) on 2.36 million admissions, surpassing Battle of Gods in 19 days. The film was the sixth highest-grossing Japanese film at the Japanese box office in 2015, with ¥3.74 billion ($31.1 million). In mid-June, the film debuted in Latin American markets grossing $7.11 million during its opening weekend. In the United States, it debuted with an $1.97 million opening from 895 theaters and grossed another $1.55 million the following day. In Australia it has made AUS $1.5 million by its third weekend of August 20–23. The film opened in Italy on September 11, 2015 and finished with a total weekend gross of €0.52 million (approximately US$0.6 million). In South Korea, the film grossed ₩176,019,000 ($155,610) in 2015. Dragon Ball Z: Resurrection 'F' grossed a final total of $8.4 million in the United States and Canada. In other territories, the film grossed an estimated $53.7 million by January 1, 2016. As of March 10, 2016, the film has grossed ¥7.7 billion worldwide, including over ¥3.7 billion in Japan and ¥4.0 billion outside of Japan. The film was released in Japan in standard and limited edition DVD and Blu-ray formats on October 07, 2015. The limited edition includes a story board book, booklet, and a Golden Freeza alarm clock, additionally each disc in this set includes bonus content as interviews, video footage from the May 9 “Goku Day” event, and much more. The home video release of Fukkatsu no 'F' sold approximately 41,442 copies in its first week. By the end of the year, it had sold 65,787 copies of both DVDs and Blu-rays. On October 20, 2015 Funimation launched to North America three versions of the home video, the Collector's Edition, Blu-ray/DVD Combo and a standard DVD. As of February 2019, the DVD and Blu-ray releases have grossed over $8 million in US retail sales. Madman Entertainment released the film in Australia and New Zealand on DVD and Blu-ray on November 18, 2015 In United Kingdom, Manga Entertainment released the DVD and Blu-ray on January 25, 2016. Selecta Visión released the film in Spain on DVD and Blu-ray on May 11, 2016. ^ In the closing credits, the English cast were listed with the characters' English names (e.g. Goku, Master Roshi, Krillin), while the Japanese cast were listed with Japanese names (e.g. Son Goku, Turtle Hermit, Kuririn). ^ a b "1st Key Visual For 2015 Dragon Ball Z Film Reveals Frieza". Anime News Network. November 17, 2014. Retrieved November 17, 2014. ^ "DRAGON BALL Z: RESURRECTION OF F [Japanese with English Subtitles] (12A)". British Board of Film Classification. September 16, 2015. Retrieved September 17, 2015. ^ "ドラゴンボールZ 復活の「F」". Natalie (in Japanese). Retrieved March 27, 2015. ^ a b Nancy Tartaglione and Anita Busch (April 19, 2015). "'Furious 7′ Drives To $1.15B Global; 'Dragonball' Big In Japan – Intl B.O. Update". Deadline Hollywood. (Penske Media Corporation). Retrieved April 20, 2015. ^ "『ドラゴンボール超ブロリー』ブルーレイ＆DVDが6月5日(水)にリリース決定！" (in Japanese). navicon. March 4, 2019. Retrieved March 9, 2019. ^ a b "Dragon Ball Z: Fukkatsu No F". Box Office Mojo. Retrieved January 1, 2016. ^ a b c Busch, Anita (August 21, 2015). "'Dragon Ball Z: Resurrection F' Heads To Home Video After A $8.4M Final Gross – Update". Deadline Hollywood. Retrieved August 21, 2015. ^ "Doragon bôru Z: Fukkatsu no 'F' (2015)". The Numbers. Retrieved January 28, 2016. ^ a b Funimation (August 4, 2015). "DRAGON BALL Z: RESURRECTION 'F' Production Notes". SciFi Japan. Retrieved August 14, 2015. ^ "Dragon Ball Z Gets New 2015 Film by Creator Toriyama". Anime News Network. July 15, 2014. Retrieved November 17, 2014. ^ "Dragon Ball Z Animation Director Tadayoshi Yamamuro Will Helm 2015 DBZ Film". Anime News Network. July 19, 2014. Retrieved November 17, 2014. ^ "Dragon Ball Z 2015 Film's Extended Teaser Streamed". Anime News Network. July 24, 2014. Retrieved November 17, 2014. ^ Martinez, Phillip. "New 'Dragon Ball Z' Movie To Premiere In 2015: Frieza Returns To Wreak Havoc On DBZ Crew [VIDEO]". iDigitalTimes. Retrieved November 17, 2014. ^ a b "Interview: Norihiro Hayashida – Produzent von DRAGONBALL Z: RESURRECTION ‚F'". Tanuki Republic. October 20, 2016. Retrieved August 11, 2018. ^ "Interview: The Past, Present and Future of Dragon Ball". Anime News Network. March 1, 2016. Retrieved August 11, 2018. ^ "New Footage For 2015 Dragon Ball Film Unveiled on TV". Anime News Network. December 5, 2014. Retrieved December 5, 2014. ^ a b "2015 Dragon Ball Film's 2nd Extended Teaser Streamed". Anime News Network. December 5, 2014. Retrieved December 5, 2014. ^ "2015 Dragon Ball Z Film Casts Momoiro Clover Z Idols". Anime News Network. February 3, 2015. Retrieved February 3, 2015. ^ a b Komatsu, Mikikazu (March 2, 2015). ""Dragon Ball Z: Resurrection of F" Trailer Introduces Golden Frieza". Crunchyroll. Retrieved March 3, 2015. ^ "Dragon Ball Z: Resurrection 'F' Film's New Trailer Features Z Warriors". Anime News Network. March 24, 2015. Retrieved March 24, 2015. ^ a b "Goku's New Super Saiyan God Form Revealed for DBZ: Resurrection 'F' Film". Anime News Network. April 9, 2015. Retrieved April 9, 2015. ^ "DBZ: Resurrection 'F' Film's Battle Ad Features Blue-Haired Goku". Anime News Network. April 11, 2015. Retrieved April 11, 2015. ^ a b "映画「ドラゴンボールZ」主題歌ジャケで、ももクロがDBキャラ風に". Natalie (in Japanese). April 8, 2015. Retrieved April 9, 2015. ^ ""Dragon Ball Z: Resurrection of F" International Version to Feature English Theme Song by Momoiro Clover Z". Crunchyroll. April 29, 2015. Retrieved May 3, 2015. ^ "Maximum the Hormone Performs 'Battle Song' for 2015 Dragon Ball Film". Anime News Network. January 4, 2015. Retrieved January 4, 2015. ^ ""Dragon Ball Z: Resurrection of F" Promotes Toho Cinemas Membership Card". Crunchyroll. December 8, 2014. Retrieved March 4, 2015. ^ "2015 Dragon Ball Z Film Gets 3-Chapter Manga Adaptation". Anime News Network. January 16, 2015. Retrieved January 16, 2015. ^ "俊輔が悟空に！！映画「ドラゴンボールＺ　復活のＦ」と合体". Sports Nippon (in Japanese). February 27, 2015. Retrieved February 26, 2015. ^ "キリン メッツCM 「キリン メッツ グレープ フリーザ」篇 15秒". YouTube. Kirin Company. Retrieved March 3, 2015. ^ "キリン メッツCM 「キリン メッツ オレンジ 悟空」篇 15秒". YouTube. Kirin Company. Retrieved March 3, 2015. ^ "ドラゴンボールZ×CoCo壱、カレー食べる悟空の大皿など当たる". Natalie (in Japanese). March 12, 2015. Retrieved March 15, 2015. ^ V Jump. May 2015 issue. Shueisha. Retrieved March 21, 2015. ^ "Resurrection 'F' Version Frieza Joins Dragon Ball Xenoverse Game as DLC". Anime News Network. March 26, 2015. Retrieved March 26, 2015. ^ "Super Saiyan God SS Vegeta Joins Dragon Ball Z: Extreme Butōden 3DS Game". Anime News Network. April 19, 2015. Retrieved April 20, 2015. ^ Porter, Matt (April 20, 2015). "Super Saiyan God Goku and Vegeta Coming In DB Xenoverse DLC". IGN. Retrieved April 20, 2015. ^ Seeto, Damian (April 17, 2015). "Dragon Ball Xenoverse DLC Pack 3 Includes Resurrection of F Content". attackofthefanboy.com. Retrieved April 18, 2015. ^ "Dragon Ball Volume 'F' to Include 2015 Film Script by Toriyama". Anime News Network. March 7, 2015. Retrieved March 7, 2015. ^ a b "Dragon Ball Z Resurrection 'F' Film to Screen in 74 Countries". Anime News Network. April 18, 2015. Retrieved April 19, 2015. ^ "Dragon Ball Z: Fukkatsu no F to Be 1st Japanese Film in IMAX 3D Theaters". Anime News Network. January 28, 2015. Retrieved March 4, 2015. ^ Komatsu, Mikikazu (February 13, 2015). ""Dragon Ball Z: Resurrection of F" Also Gets 4DX Screenings". Crunchyroll. Retrieved March 4, 2015. ^ V Jump. March 2015 issue. Shueisha. Retrieved March 21, 2015. ^ "Funimation to Host Dragon Ball Z: Resurrection 'F' Film's World Premiere". Anime News Network. March 15, 2015. Retrieved March 15, 2015. ^ Martin, Michael (May 26, 2015). "Dragon Ball Z: Resurrection of F Gets Limited North American Release". IGN. j2 Global. Retrieved May 26, 2015. ^ a b Anita Busch (August 6, 2015). "'Dragon Ball Z: Resurrection F' Two-Day Grosses Stun At Domestic Box Office". Deadline Hollywood. Retrieved August 7, 2015. ^ "Dragon Ball Z: Resurrection 'F' Now Showing in Australian cinemas". Madman Entertainment. August 10, 2015. ^ "Madman Entertainment Announcements from Supanova Expo Gold Coast". Anime News Network. April 21, 2015. Retrieved April 30, 2015. ^ Walton, Jordan (July 25, 2015). "MCM Manchester 2015: Manga UK / Animatsu / Kazé". jcuri.com. Retrieved August 3, 2015. ^ "Dragon Ball Z: Resurrection 'F'". Rotten Tomatoes. Retrieved November 10, 2015. ^ Saris, Shawn (July 29, 2015). "Frieza's Final Form…Again!". IGN. Ziff Davis. Retrieved August 3, 2015. ^ Leach, Sam (August 3, 2015). "Dragon Ball Z: Resurrection 'F' - Review". Anime News Network. Retrieved August 10, 2015. ^ "第60回「映画の日」中央大会開催、金賞は「妖怪ウォッチ」「ベイマックス」" (in Japanese). 映画.com. December 2, 2015. Retrieved March 12, 2016. ^ "Umimachi Diary, Boy & the Beast, Bakuman Win Japan Academy Prizes". Anime News Network. March 4, 2016. Retrieved March 12, 2016. ^ a b "DBZ: Resurrection 'F' Film Sells 716,000 Tickets for 960 Million Yen". Anime News Network. April 20, 2015. Retrieved April 20, 2015. ^ "DBZ: Resurrection 'F' Film Seen 1 Million Times in 7 Days". Anime News Network. April 24, 2015. Retrieved April 25, 2015. ^ Komatsu, Mikikazu (May 7, 2015). ""Dragon Ball Z: Resurrection of F" Surpasses "Battle of Gods" in 19 Days". Crunchyroll. Retrieved May 8, 2015. ^ Komatsu, Mikikazu (May 8, 2015). "Box Office: 19th "Detective Conan" Film Beats "Dragon Ball Z: Resurrection of F"". Crunchyroll. Retrieved May 8, 2015. ^ "Top 10 Grossing Domestic Japanese Films of 2015 Listed". Anime News Network. January 1, 2016. Retrieved January 1, 2016. ^ "Updated Global Report: 'Jurassic World' Closes In On $1 Billion Worldwide After Just 12 Days; 'Inside Out' Opens To Strong $41 Million From Early International Releases, But Behind 'Minions' Down Under". BoxOffice. June 21, 2015. Archived from the original on March 4, 2016. Retrieved June 28, 2015. ^ "Urban Cinefile - Box Office". urbancinefile.com.au. Retrieved August 24, 2015Select "Week, August 20–23, 2015"
^ "Dragon Ball Z - La resurrezione di 'F'". mymovies.it (in Italian). Retrieved September 24, 2015. ^ "Dragon Ball Z: Resurrection 'F'". Box Office Mojo. Retrieved March 1, 2016. ^ "영화정보". KOFIC (in Korean). Korean Film Council. Retrieved February 15, 2019. ^ Barder, Ollie (August 16, 2015). "Latest 'Dragon Ball' Movie Ends Its Run With Historic $8 Million Box Office". Forbes. Retrieved September 15, 2015. ^ ""Dragon Ball Z Resurrection F" Won the Japan Academy Prize for Best Animated Film at the 39th Japan Academy Awards! The movie was released in 45 countries worldwide and became a smash hit, making 7.7 billion yen at the box office!!". Toei Animation. March 10, 2016. Retrieved January 23, 2019. ^ Putignano, Anthony (June 29, 2015). "Dragon Ball Z: "Revival of 'F'" Japanese Home Video Release". Dragon Ball Insider. Retrieved June 29, 2015. ^ "Japan's Animation DVD Ranking, October 5-11". Anime News Network. October 13, 2015. Retrieved October 13, 2015. ^ "Anime DVD/BD Sales in Japan 2015 10/05 – 10/11 Weekly Sales List". Retrieved October 13, 2015. ^ "Top-Selling Animation in Japan on Blu-ray Disc/DVD by Series: 2015". Anime News Network. December 29, 2015. Retrieved August 20, 2016. ^ Osborn, Alex (August 20, 2015). "Dragon Ball Z: Resurrection 'F' home video release date, box art revealed". IGN. Ziff Davis. Retrieved August 21, 2015. ^ "Doragon bôru Z: Fukkatsu no 'F' (2015) - Financial Information". The Numbers. Retrieved February 8, 2019. ^ "Dragon Ball Z: Resurrection 'f' (Blu-Ray)". Madman Entertainment. Retrieved January 28, 2016. ^ "Competition: Win Dragon Ball Z: Resurrection F Collectors Edition Blu-ray". AnimeBlurayUK. January 18, 2016. Retrieved January 18, 2016. ^ "Detalles de Dragon Ball Z: La Resurrección de F en Blu-ray 3D y 2D" (in Spanish). Retrieved March 29, 2016. Dragon Ball Kai: Peace For the Future! The Spirit of Goku is Forever! This page was last edited on 13 April 2019, at 04:42 (UTC).